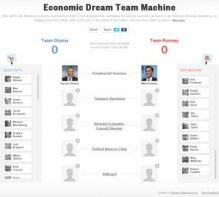 As the U.S. presidential candidates head to their final debate, we’ve added new choices for key economic jobs. Should financial reformer Barney Frank have a spot? Can deficit hawk Martin Feldstein, or Treasury’s No. 2 Neal Wolin, help fix the U.S. fiscal mess? The Republican indicates a George W. Bush-like interventionist approach, another step away from the party’s pre-World War Two isolationism. That could lead to more Middle East conflict and defense spending, eating savings from thriftier budgets. It’s also just as risky as Obama’s stance. One regional head of the U.S. central bank admitted the latest QE broadside would debase the dollar. Another said an above-target inflation rate would be tolerable. Both follow from the Fed’s war on stagnation, but actually saying so could bring domestic and foreign brickbats. The FOMC bewailed slowing U.S. growth but made no policy changes. Absent crises, more quantitative easing this year is unlikely. QE3 may anyway be more effective in theory than in practice. After the U.S. election, though, the Fed may face much tougher choices. Washington looks set to repeat last year’s battle over the nation’s borrowing limit. That was almost a debacle. But the messy spectacle serves to put reducing deficits in the spotlight, forcing Congress to ensure that borrowing remains manageable. That should be welcomed. The U.S. central bank’s double focus on prices and jobs blurs its mission. And aggressive efforts to smooth hiring cycles risk unintended consequences. They also let fiscal policymakers in Congress off the hook. A plan to make the Fed fixate on prices alone could change that. Opposition to the euro zone fiscal compact is mounting among centre-left parties. This could derail ratification by some member states. But rules to enforce strict fiscal discipline are already part of European law, and Germany and the ECB are still calling the shots. Euro zone leaders are wasting an opportunity to be more flexible about deficit targets. Their blind discipline-obsession is self defeating. In the short term, excessive austerity will worsen the recession. In the long term, it will compromise efforts to ensure fiscal prudence. The government is under fresh pressure to scrap its top tax rate. That would make economic sense. The snag is that it would be politically difficult. The way forward is to introduce a more intelligent levy on the wealthy – say, a revamped property tax. The proposal of socialist presidential contender François Hollande to tax income above one million euros a year at 75 pct is bound to backfire. Either he’s serious – and French business will suffer. Or he’s not – and he’s on the way to a massive loss of credibility. Karl Marx and Bill Clinton’s campaign managers believed economic factors controlled politics. That’s wrong, as Egyptians and Russians have shown. Voters have other – often more noble – concerns. The assumption also leads politicians into ultimately unproductive policies. Taxing financial transactions looks a neat way to raise revenue from an unpopular sector. However, reducing liquidity won’t make markets more efficient. It also won’t make banks any safer, or stop asset bubbles. There are better ways for politicians to get their pound of flesh. Forget the provocative Buffett Rule. Obama’s simpler proposal to cut tax deductions could add up to $9 trln to the government’s revenue over 10 years. There’s even a hint of common ground with the GOP. Best of all, killing off many deductions would do little economic harm. With U.S. unemployment hovering above 9 pct, Alan Krueger - a Princeton labor market expert - is suited to be the next White House chief economist. But his job creation ideas may not get much of a hearing. With Obama campaigning, political pros will have the president’s ear.